In this tutorial, you’ll use a machine learning algorithm to implement a real-life problem in Python. You will learn how to read multiple text files in python, extract labels, use dataframes and a lot more! For this tutorial, you will be working with a text dataset Deceptive Opinion Spam Corpus as an example. Then you’ll preprocess the data: By removing stopwords from the hotel reviews using a natural language toolkit library and extract parts of speech for each word in your dataset. Once you have preprocessed your data then you are all set to prepare your data training: You’ll start by splitting your data into training and testing, learn about Tfidf, vectorize your training and testing data, implement the support vector machine model, save both: the Tfidf vectorizer for your data and the model, then load them back. Finally, you’ll predict on the test data: Plot the confusion matrix, accuracy score, and confusion matrix to check the effectiveness of the model, you will also test your model by splitting training and testing data with different random states, and lastly you will be using two online Yelp reviews and test your model on them. Before you go ahead and load in the data, it’s good to take a look at what you’ll exactly be working with! The Deceptive opinion spam dataset is a corpus consisting of truthful and deceptive hotel reviews of 20 Chicago hotels. The data is described in two papers according to the sentiment of the review. In particular, the article discusses positive sentiment reviews in 1 and negative sentiment reviews in 2, feel free to refer to the papers for more in-depth knowledge. 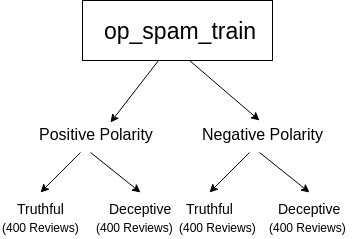 In total you have 1600 reviews, your task will be to classify the truthful and deceptive hotel reviews using a machine learning algorithm. You start with importing all the required modules like os, pandas, nltk, regex and most importantly Sklearn since in today’s tutorial you will be using a machine learning algorithm Support Vector Machine that is provided by the Sklearn library! You will need os for iterating over the folders and subfolders in which the text files reside, fnmatchwill come handy for filtering only the text files and ignore everything else present in the folders, pandas will help you in putting your data in the form of rows and columns and you can perform various data manipulations using pandas. Regex helps in extracting data based on the pattern you specify it to match so that you will need that too! Nltk is a natural language toolkit which will help you to remove stopwords which you do not want your model to learn. Then most importantly you will import Sklearn that will provide you a bunch of libraries which you will use to manipulate the data, vectorize the data, learn the boundary between the data points using a machine learning algorithm and finally plot the accuracy. After importing the libraries, your next task is to extract the labels of the data. The labels will help the model in discriminating between the reviews, whether a particular review belongs to a truthful or a deceptive class. You will first iterate over all the text files and get the absolute path of all the text files through which you will then extract the corresponding labels. There should be 1600 paths each representing a new text file. Let’s quickly verify it! Let’s also print one of the text file paths. So, from the above output, you can observe that in order to extract the labels we need some kind of filter. And for that, you will use Regex also known as a regular expression. Once the labels are extracted in a list called label, let’s create a dataframe of the list. Let’s print first five rows of the labels dataframe. Once you have extracted all the labels, it’s time to extract the reviews from the text files! As before, you will now create a dataframe of the review list. Let’s print first five rows of the reviews dataframe. Great! So, till now it was quite intuitive. Isn’t it? Let’s now merge both the labels and the reviews dataframe! After they are merged, you have a new dataframe by the name result. Let us also print few rows of this new dataframe. When you deal with text data, it is vital to remove stopwords. Stopwords are not meaningful, and they do not give any information that can help the model learn a pattern in the data. You will create a new column in the dataframe by the name review_without_stopwords. The lambda function will process on all the rows of the HotelReviews column. You will use a list comprehension and store only those words in the new column which are not present in the stopvariable. Note: In order to execute the below cell, you might need to run the above lines of code in your terminal. Let’s quickly print the dataframe without stopwords! grant it, this hotel seems very nice, but i wa… deceptive grant it, hotel seems nice, pleased stay here…. As per 1 which suggests that truthful and deceptive opinions might be classified into informative and imaginative genres, respectively. There is a strong distributional difference between informative and imaginative writing, namely that the former typically consists of more nouns, adjectives, prepositions, determiners, and coordinating conjunctions, while the latter includes more verbs, adverbs, pronouns, and pre-determiners. However, that deceptive opinions contain more superlatives is not unexpected since deceptive writing (but not necessarily imaginative writing in general) often contains exaggerated language. So, let us now for each word in the row of the dataframe extract its respective part of speech and you will then feed this as a feature vector into your model. For pos tagging, you will use TextBlob, which is a Python library for processing textual data. It provides a simple API for diving into ordinary natural language processing (NLP) tasks such as part-of-speech tagging, noun phrase extraction, sentiment analysis, classification, translation, and more. Note: In order to run the pos function cell, you might need to run the following lines of code in your terminal window. os1 dataframe’s each row will consist of a list of words with their respective part of speech. You will not be able to vectorize a list which you will be feeding into the model. So, you will have to convert these rows of lists into string. Let’s convert each row into a string, where each word will be joined with its corresponding posusing a forward slash, and a single space will separate the words. Finally, let’s merge the pos column with the main result dataframe and print first few rows of it! Once you have the features extracted, now is the time to split the data into training and testing. For this tutorial, you will be splitting the 80% of the data into training and the remaining 20% into testing. The weighting technique helps machine learning (ML) model during classification as we explicitly tell which word weighs more/less. Now, that you know about it, let us implement it on the training and testing data. Now, you will be implementing a machine learning model known as Support Vector Machines (SVM). In order to understand it you can follow this link. To select the best hyperparameters for your ML algorithm, you will use GridSearchCV, which based on your training data and labels suggests you the best hyperparameter values out of the values that you specify as a list. You will choose five different values for Cs and gammas and based on your data; you will get the best hyperparameter values. Let’s save the model that you just trained along with the Tfidf vectorizer using the pickle library that you had imported in the beginning, so that later on you can just simply load the data, vectorize it and predict using the ML model. /home/naveksha/.local/lib/python3.5/site-packages/sklearn/base.py:311: UserWarning: Trying to unpickle estimator SVC from version pre-0.18 when using version 0.19.1. This might lead to breaking code or invalid results. Use at your own risk. /home/naveksha/.local/lib/python3.5/site-packages/sklearn/base.py:311: UserWarning: Trying to unpickle estimator TfidfTransformer from version pre-0.18 when using version 0.19.1. This might lead to breaking code or invalid results. Use at your own risk. /home/naveksha/.local/lib/python3.5/site-packages/sklearn/base.py:311: UserWarning: Trying to unpickle estimator TfidfVectorizer from version pre-0.18 when using version 0.19.1. This might lead to breaking code or invalid results. Use at your own risk. The above confusion matrix is a 2 x 2 matrix in which, first row first element is True Positive (TP), first row second element is False Negative (FN), second row first element is False Positive (FP) and second row first element is True Negative (TN). From the above confusion matrix, you can conclude the only 10 test samples out of 320 were misclassified. From the above predictions, you can observe that the Model did a Fantastic Job and is not overfitting since you tested the model several times by splitting the data differently everytime. Well, the model predicted the above two reviews correctly. The first review is a Truthful review while the second review is a deceptive one! The model’s performance varies when implemented on a different processing system having different specifications, this is an unusual behavior observed. If the community can help figure out this problem, it would help a lot of people including the author of this post. By community, it means the readers who will go through this tutorial!